Many people successfully met the challenge, however, as evidenced by all the comments left. Most amazing of all was CN member Sasa, who reported "I was able to glimpse this galaxy in a 4-inch (10cm) refractor [Sky-Watcher ED100]." And I thought I was good spotting it through my 18-inch (46cm) Dob! Then last April, I threw down the gauntlet and challenged you to find Leo II. Leo II is another dwarf spheroidal galaxy within Leo. Most feel it's even more difficult than Leo I. After several failed attempts, I finally captured Leo II a few summers ago through my 18 inch (46cm). In last year's article, I wrote "At 171x, it appeared as a very faint, oval disk extending perhaps 6'x4', or about half of its full size in photographs." Once again, many readers accepted the challenge, but only one posted a success story. CN'er SNH reported "I tried to see it and was successful in my 10-inch (25cm) SCT. 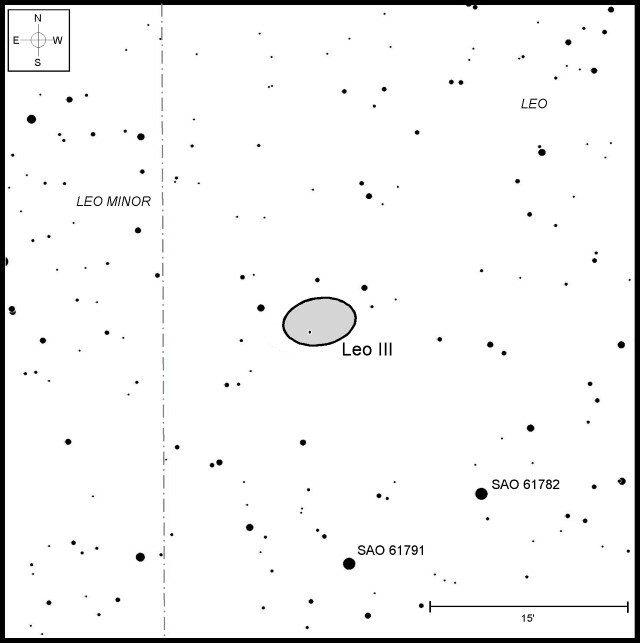 Now I've seen Leo I, Leo II, and Leo III! Sweet." Having set those wheels in motion, we are back this April to try for Leo III. While I categorized those first two as "Monster Scope" challenges, defined as requiring 15-inch (38cm) and larger apertures, I'm posting Leo III in the "Large Scope" category. Most who have spotted Leo III report it is easier to see than Leo II, and since SNH spotted it in a 10 inch (25cm), it makes sense to categorize it as such. Leo I and Leo II were both discovered by astronomers Robert Harrington (no relation) and A.G. Wilson as they scanned a Palomar Sky Survey plate back in 1950. Based on that designation, wouldn't you expect that Leo III was found after the other two? I did, but I was wrong. Actually, Leo III was found in 1942 by Fritz Zwicky. The discovery was announced in his paper On the Large Scale Distribution of Matter in the Universe, which appeared in Physical Review, vol. 61, Issue 7-8, pp. 489-503. It's likely that the sequence of discovery also led to Leo III's alter ego of Leo A. Others may prefer its catalog designations UGC 5364 or PGC 28868. For this article, however, I'll stick to referring to it as Leo III, if only to continue our tradition born two years ago. Leo III is classified as a dwarf irregular galaxy. Like Leos I and II, it is a member of the Local Group. It lies 2.6 million light-years away, 100,000 light-years farther than M31. Studies published in 2007 showed that Leo III has an estimated mass of 8.0 (± 2.7) × 107 solar masses. That study, Stellar Velocity Dispersion of the Leo A Dwarf Galaxy (The Astrophysical Journal. 666 (1): 231–235), went on to say that at least 80% of that mass consists of mysterious dark matter. A second paper from 2007 also demonstrated how Leo III is unique among irregular galaxies. It's believed that most irregular galaxies are the offspring of galactic collisions, where intertwining gravity disrupts a galaxy's original structure. But Leo III is all alone. It shows no indications of any interaction or merger on a galactic scale for the past several billion years. In Leo A: A Late-blooming Survivor of the Epoch of Reionization in the Local Group (The Astrophysical Journal, Volume 659, Issue 1, pp. L17-L20), the authors stated that more than 90% of the stars in Leo III formed less than 8 billion years ago. So, let's go hunting for Leo III. Not only is it isolated from other members of the Local Group, it's also isolated in the sky from any handy nearby stars. The closest naked-eye star, Rasalas [Mu (μ) Leonis], the star at the top of Leo's "Sickle," is the best launching point for starhoppers. Aim your finder its way, but then offset it to the southern edge of the field. After doing so, and depending on the size of your finder's field, you may notice that a 5th-magnitude star just crept into view along the northeastern edge. That's 20 Leo Minoris (LMi), 6.2° north-northeast of Rasalas. Leo III lies a little more than three-quarters of the way along an imaginary line running from Rasalas to 20 LMi. You'll know you're getting close when you see two close-set, orangish 8th-magnitude stars, SAO 61782 and SAO 61791. They are 12' apart from each, and form the base of an arrowhead-shaped pattern with Leo III, which lies at the tip. As a guide, look for an arc of 11th- to 14th-magnitude stars just beyond the galaxy's soft glow that collectively run parallel with Leo III's gentle curve. To help you in your search, here are three images of Leo I, II, and III, posted in 2013 by the late CN member from the UK Nytecam (Maurice Gavin), who passed away last year. 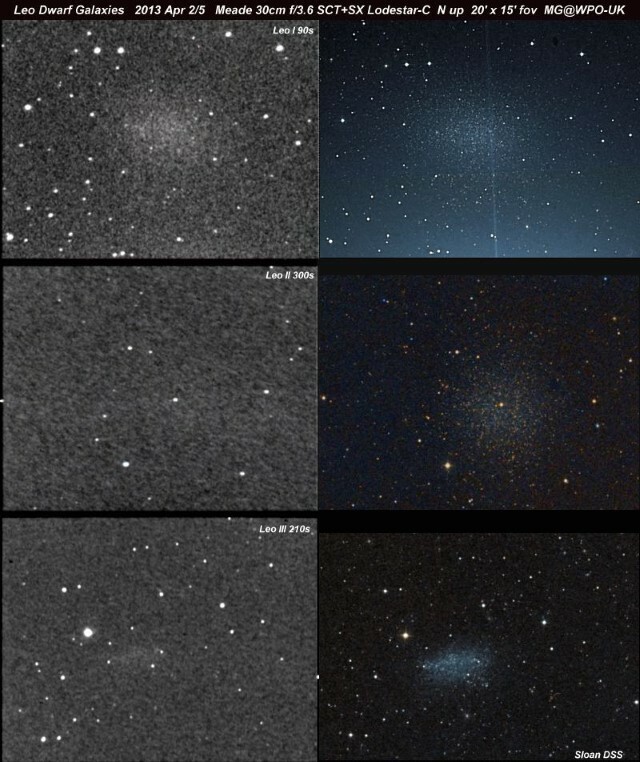 Maurice's images, on the left, were all taken through a 12-inch (30cm) Schmidt-Cassegrain, in his words "under typical LP [NELM ~3.5] skies," while those on the right are from the Sloan Digital Sky Survey. They illustrate the relative brightness of each compared to the others nicely. I would be interested in hearing readers' impressions of the shape of Leo III. Do you see it as triangular? Post your thoughts in the comments section below. And how about Leo IV? That one is FAR tougher than Leos I, I, or III. I've never been successful at ferreting that one out. Have you? If so, please send me your observations so I can feature them in the April 2020 challenge. 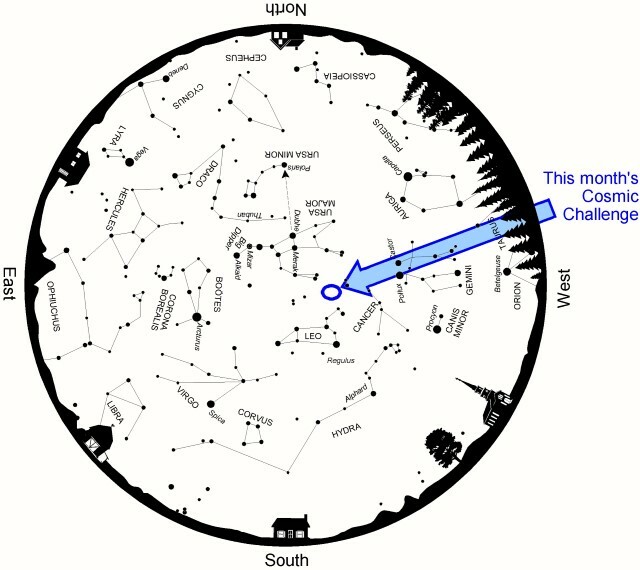 Phil Harrington writes the monthly Binocular Universe column in Astronomy magazine and is the author of 9 books on astronomy, including Cosmic Challenge: The Ultimate Observing List for Amateurs. Visit his web site at www.philharrington.net to learn more. Like the ever ready battery -- Phil is still going! Keep rolling them out Phil. Leo III is doable (I have seen it), but Leo IV does not appear to be. It is rather large in apparent diameter but exceedingly faint with a central surface brightness of 27.5 MPSAS...that is a full 2 magnitudes past even an optimistic estimate of the level that the eye might be able to detect contrast vs. the background. I don't see any real hint of it in the SDSS III images. This puts the "ultra" in "ultra faint dwarf galaxies." Having said that, a large enough scope in pristine conditions might be able to detect the brightest clearly indentified member star in Leo IV, which is at ~19.0 mag. And there aren't many others even close. The next brightest identified on the CMD is at 20.0 mag and then a few more at 21. After that is the horizontal branch at about 21.5. There are other stars that are somewhat brighter on the CMD in the 18-19 mag range, but I don't know if any of them have been identified as members. I would love to do this challenge, but I can't because of the city I live near. I haven't been able to spot Leo I nor Maffei I, using my 10" under good dark skies, but I only tried them once. By the way, I saw once one or two very faint stars, around mag 15 in NGC206 in Andromeda galaxy. My frustration is clear skies when the moon is absent. I'm hoping to try this one at the Cherry Springs Star Party with my 12.5" Teeter, my "big scope".